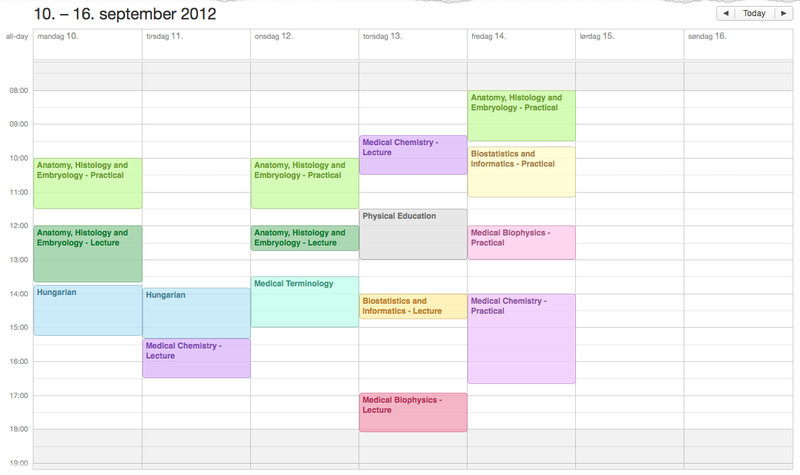 I have to admit that I absolutely LOVE my schedule. I only have one day where I start at 08:00 and my latest class doesn’t run past 18:05. Aside from Anatomy, I have all my practicals on Friday, which means I should be able to prep solidly after the lectures earlier in the week. I feel like our group got very lucky with the time-placement of our different classes: Skjalg has one day where he has a 5-hour break between two classes and there is one group that has two days where their classes run from 9:20 in the morning until 20:00 at night. You are currently reading First Semester’s Schedule at Buda-B.